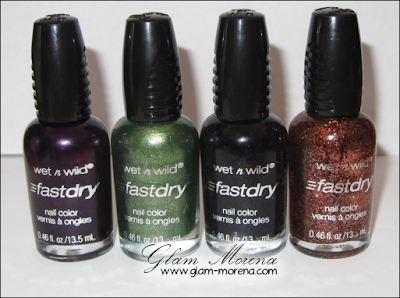 Glam Morena: Wet n Wild On The Prowl Collection. Wet n Wild On The Prowl Collection. Wet n Wild has a new Fall 2011 collection. It's the On The Prowl Collection, which features eight limited edition Fast Dry Nail Colors. This collection will be out on shelves Late-August. Another collection coming out this Fall will be the Wet n Wild Fantasy Makers and I'll have a post on that later on this month. Rawr! Create seductive nail art that’s sure to catch any prey! Combine a base coat with a nail art top coat for a look that’ll have them wrapped around your fingers! Now on to swatches of the Wet n Wild On The Prowl Collection! What's your favorite shade from this collection? I love correction tape and I also like behind close doors. Hopefully we get these, these wet and wild collections are always a hit or miss for me. Buy Me A Drink looks pretty! Ooooh pretty!! I love all those colors...great for the fall season!! I hope they sale them in my city soon!! I really like all of these nail colors, but Correction Tape looks familiar. It reminds me of Party of Five Glitters with more glitter.